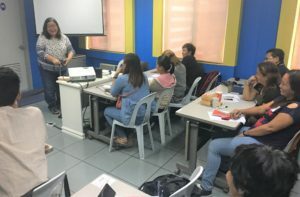 The “Writing Seminar for Healing and Self Discovery” aimed to utilize creative writing as a tool for former distressed OFWs to start the process of recovery, re- discover their self-worth and purpose, and map out their life plans. The workshop was a pilot program and was intended to be replicated to benefit more OFWs all over the country. The Seminar was made possible with support from the Pag-IBIG Fund and the Philippine International Trading Corporation (PITC). Ms. Susan V. Ople, President and Founder of the Blas F. Ople Policy Center and Training Institute, was the main facilitator of the workshop. 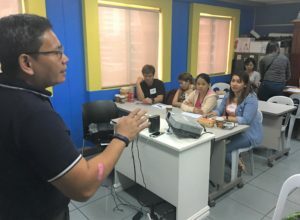 Mr. Jerome Alcantara, the Ople Center’s Executive Director, and Ms. Roccio Olbes, a fashion designer and motivational speaker, served as facilitators and resource persons for the workshop. Fifteen (15) OFWs and family members participated in the workshop. The OFWs had different occupations. Some of them were factory workers, domestic workers and administrative staff. They worked in different countries. Some came from Asian countries like Taiwan, Malaysia, and Singapore while some came from Middle Eastern countries like Dubai and Lebanon. Twelve (12) of the participants were victims of illegal recruitment or other forms of migrant abuse. The remaining three (3) are former OFWs who volunteer in helping fellow workers. Mr. Alcantara started the seminar by asking the participants to introduce and share an interesting fact about themselves. The OFWs talked about their hobbies, dreams and aspirations in life. Mr. Alcantara told the participants that writing also works the same way. When a person writes, he or she shares a part of themselves to others. As an ice breaker, Mr. Jerome introduced a game called “Human BINGO”. 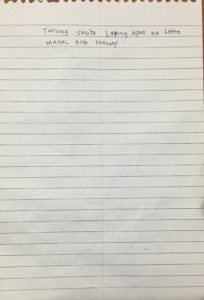 The participants were given a piece of paper that had different categories such as nickname, favorite color, favorite date place, favorite television series, and favorite subject. They were instructed to ask other participants to fill up their paper and the first one to complete the sheet was considered the winner. 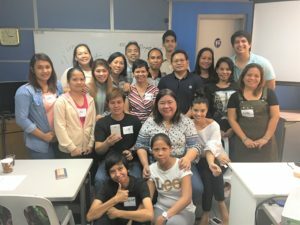 The purpose of the game was to help the OFWs become comfortable and get to know each other better. The first writing exercise is entitled “My First Love”. Mr. Alcantara instructed the participants to look back on their first love. He asked them to describe the person, reminisce what they felt during that time, or describe their experience. Mr. Alcantara reminded the participants to be as accurate as possible in describing persons, places or events. 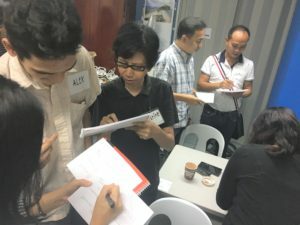 The main objective of the exercise was to teach the OFWs the importance of using adjectives and descriptions to create a vivid portrayal of their memories. The next activity was the Life Mapping exercise. 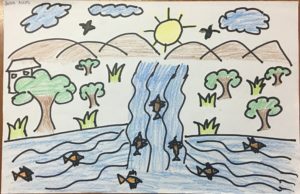 Mr. Alcantara asked the participants to draw a river. The river would symbolize the life of the participant where they can indicate significant moments in their lives. They can illustrate high points and low points in their lives. They can also depict obstacles that they encountered using boulders. They are free to use other symbols to represent the different elements of their stories. He asked four (4) OFWs to share their output. They talked about their lives, their dreams, and their struggles as an OFW. They also shared how a lot of people helped them achieve their goals. 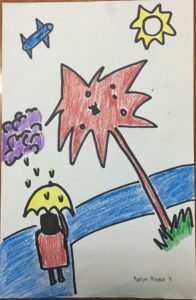 The next writing activity was entitled “Dear Me”. 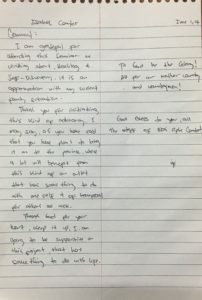 The OFWs wrote a letter addressed to their younger selves. They wrote letters that had advices and simple reminders that they wanted their younger selves to know. Some of them also wrote about the challenges they would face and how to overcome those challenges. Miss Susan Ople shared her experiences and some practical tips in writing. She shared that writing helped her go through some of the most difficult moments of her life. She recounted that when her father, Ka Blas F. Ople died in 2004, writing about the memory, life, and times of Ka Blas helped her cope with her loss. She said that this would also have the same effect with the OFW participants who all had to go through difficulties in their lives. Miss Ople showed a video of two poets. The first was a video of National Artist Virgilio Almario (aka Rio Alma) reciting his work, Poem #45. The second video shown was a spoken word performance by Juan Miguel Severo. The participants were asked who among the two poets they prefer. 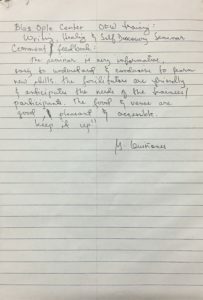 The participants were split – some favored the calm, methodical piece written and delivered by Rio Alma while others were moved by the frantic ode to love by Severo. Miss Ople explained that writing to express does not need to follow a strict structure or format. She provide some tips on how to write with rhythm such as alternating short, declarative sentences with longer and more complex ones. She encouraged participants to write concisely and accurately by omitting needless words. Ms. Roccio Olbes’ discussion meant to inspire the OFWs. She told them that life would have its challenges but there would always be people to help you along the way. Ms. Roccio also used the acronym H.O.P.E. (Hold On Pain Ends) to remind the OFWs to always have hope and be resilient because struggles are never permanent. She told them to never give up and keep on going because the world would not stop revolving despite the challenges. Instead of focusing on the problems, Ms. Roccio said to focus on being hopeful that things would get better. Miss Roccio shared the experience of her brother who ran and lost during the last elections. She said that her brother fell into depression after his loss but recovered and is now finding other ways to help people aside from serving in an elective post. 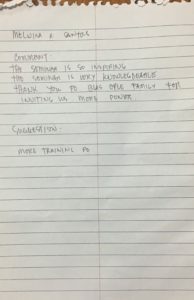 The last writing exercise for the seminar was meant to practice what the participants learned. 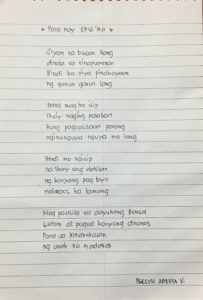 Ms. Susan asked the OFWs to write a poem addressed to the person they love. 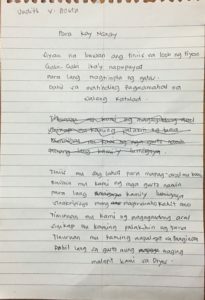 Most of the OFWs wrote poems dedicated to their mothers. In their poems, the OFWs wrote how their mothers took care of them and how hard they worked so they could provide for their families. They also thanked their mothers for molding them into the persons that they are today. Ms. Susan ended the seminar by giving out comments to the OFWs and tips on writing. 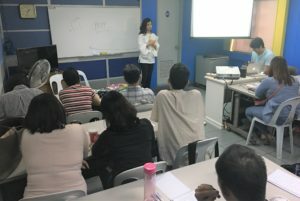 She also suggested that the OFWs should create a group so that they could also share techniques to other OFWs who want to learn and improve on their writing skills. The participants appreciated the workshop. They thanked the Ople Center for organizing the workshop and said that they look forward to forming an OFW Writers’ Club.